Back in November I posted this idea about giving a fellow indie author a review for Christmas. At the time I said I had two stories in mind. Then I changed my mind, and went for a whole anthology of them. 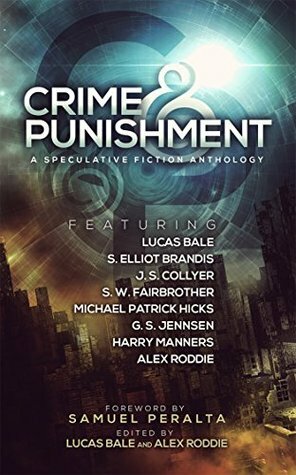 This anthology appealed to me because when I think of my usual reading and writing habits, ‘crime and punishment’ is at the heart at just about everything I enjoy in fiction. I recently had a conversation with a fellow reader readers about the ending of Breaking Bad. Not bothered about spoilers because he says he’ll never watch it, one of the first things he asked about Walter White was ‘Is there redemption?’ I won’t create a spoiler with an answer to that, but it did get me thinking that the key to any good story anthology based on crime and punishment is bringing that question into play. Redemption, atonement, call it what you like, it needs to be there. Lucas Bale and Alex Roddie’s anthology does this well, using a combination of stories with diverse settings, contexts and characters to bring to life everything I like when it comes to the above ideas. The emphasis is on the fiction rather than the science, which is my personal preference, although it’s clear that some good planning and world building has gone into these stories; they’re all imaginative and well crafted. If you’ve read the other books in Lucas Bale’s Beyond the Wall series, you will like this story. If you haven’t, the beauty of it is that it doesn’t really matter – you’ll like is anyway. It’s easy to understand without masses of world-build background, but there are some nice details to spot for existing fans. One of the things I liked about Bale’s first two BtW novels, Heretic and Defiance, was that is showed different sides of the world: the good and the bad, respectively. There’s further insight here, as the author takes us inside the mysterious ‘Seneshal,’ and reveals a little about how it operates and who it uses. The protagonist Lahm is a highly capable and violent character who takes the reader for a ride that’s fast, brutal, and brilliant. Once again, Bale’s economical style triumphs. This is a fiendishly clever story from start to finish. A great use of the first person narrative, because the one observing ‘camera’ effect lends itself well to the ‘Schroedinger’s Cat’ idea this story centres around. The author has used his own fascination with probability without getting too caught up in it – the ideas drive the story rather than it just being another maths/physics lesson through fiction. It’s always easy to go for the ‘sliding doors’ effect in a story like this, but Brandis takes it places far more interesting. It’s a good topical story, in a year where immigration and refugee crisis have dominated the headlines. How exactly do you control that sort of thing without getting into murky territory and dangerous ethics? Honestly, this is a take on those sorts of ideas I wish I’d written. I can’t spoil it, but I loved how this story ended as well. I’ll admit a certain amount of reviewer bias here, and I did say this much to the author herself: I’m fond of starting off with an unusual character name, thinking up an appearance and personality, sticking them in a world I’ve built and then introducing context. This story is a great example of why I think this approach to writing works so well. This story is the odd one out: it features an ‘alien’ main character with limited viewpoint and completely non-human thinking. To me it wasn’t always completely clear what was going on in this story, it was a case of reading on to see if anything became clear later. For me personally it didn’t much, but I got the feeling that perhaps this was the point: it’s an exploration of another world designed for interpretation. I award this a neutral 3 because it’s not my sort of thing, but it’s well written for anyone who does like their sci-fi to get this otherworldly and isn’t so caught up in action followed by resolution. ‘Oubliette’ lacks a sympathetic character and I didn’t really care what happened – it was an exploration read that didn’t really fulfil me in the end. I might have gone with a two star review if it weren’t for one saving grace: Fairbrother is clearly a decent writer, because the descriptions in this story are strong. Even when I was trying to figure out where I was and what was happening, I enjoyed the imagery here. There’s enough tendrils of theme to at least make it clear why it belongs in this anthology, and it was admittedly nice to have the diversity of story style to try rather than just the comfort zone of always reading the action based ‘human’ stuff that I prefer. Having read almost all of this author’s catalogue, I did go into this story with certain expectations, and they were all fulfilled. Sci-fi horror genre cross, generous helpings of the grotesque, some ultra-violence and hidden fugitives to chase. I liked how this story plunged into the future world and its ‘beasties’ without worrying too much about explaining it until later. Hicks as an author is pretty ruthless about dispatching characters, and giving protagonists backstory it’s hard to sympathise with and then keeping them sympathetic anyway. If you want a quick intro to his work, you can’t go wrong with this. I loved one scene set in a bar and leading up to some pretty cool action – for some reason it gave me a From Dusk Till Dawn vibe even though this story is nothing to do with vampires. In this review I originally wrote: ‘This could have been a bigger, deeper story and has me thinking that Jennsen’s style lends itself more to novel length work.’ I’ve since looked at the author’s website and found out this story is indeed part of a much bigger picture. The praise here lies in how it did make me want to check her other books out. I’m not sure if this is actually the longest story in the anthology, but it’s the one that took me longest to read despite its relatively quick pacing. Is it too long? Personally I don’t think so; I liked how it didn’t rush into the pivotal scene or the climax. It’s a slow burner even when the action’s fast, and justifies that extra weight it carries as a result. It acknowledges its influence beautifully with the main character saying ‘Let me guess. You’ve been watching me for a long time.’ a one liner which I enjoyed, along with the response she gets. Backstory linking to main story is used to great effect – it breaks up the pace and still keeps the reader’s attention. Arcadio’s Valley is another effective story about how pervasive technology is becoming and how the storage of data has fundamental implications, but it’s never preachy or one-sided. As a reader with an occasional fascination with cars, I did enjoy a later scene in this story as well were a dash of ‘vintage’ came in. This brilliant combination of sci-fi and primitive setting is the best saved for last. I admit to a certain amount of personal preference being behind my liking for this one: some of my non-writer activities involve conservation, and this is a story written with human treatment of the natural world in mind. It’s called The Great Correction but it could just as easily have been called The Great Debate – what’s behind it is the question of how far people should go to restore what they see as the right natural ‘balance.’ What is balance, anyway? I like trees and chainsaws in equal measure in my real life conservation, and it seems the people in this story have a healthy sense of how the world can provide your resources, but you also have to respect it. The trouble is, they’ve paid a price for the kind of ‘balance’ many real world conservationists sometimes wish for. All the way through reading TGC, I remembered a song lyric ‘we’re all inmates in the human zoo’ (I think it was a 10CC song). The idea of voluntary human enslavement was scarily believable in this story. The real brilliance of this story lies in the setup. How do I do this without spoilers? Let’s just say the idea of humans always needing a ‘failsafe’ comes into play, but in a way I’ve never seen before. The ‘this is our one chance’ trope creates an almost unbearably brilliant tension in this story. There’s a truly heartbreaking quality to some of this story, and yet the glimmers of hope do come through. It reminds me of Hugh Howey’s afterword to the silo series: there’s good and bad in all things. I never could have seen the ending of The Great Correction coming, although it made perfect sense once delivered. On a personal note, I like the names in this story. I’ve never thought of Birch as a name before, but as unusual choices go, it works. Trees are used creatively for that extra touch that reaches any reader who likes the natural world used in sci-fi stories.